Sandy Valley Baptist Church began in May 1967, as a mission sponsored by First Baptist Church of Centerville, with the Rev. James (Doug) Boss as pastor. Enrollment began with seven members but quickly grew to twenty-six only two months later. By September of that same year, the mission became self-supporting. October 1968, Central Baptist Church of Warner Robins became the new sponsor of the mission and on July 9, 1969 purchased the land where Sandy Valley is currently located. 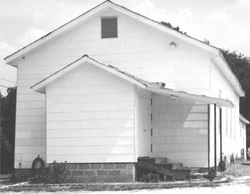 In September 1969, Salem Baptist Church near Montezuma was disbanded and voted to donate their church building, all pews and equipment to Sandy Valley. January 4, 1970, Sandy Valley Baptist Mission was constituted as Sandy Valley Baptist Church, with 117 charter members. In February 1971, Rev. Ray Freeman was called to be Sandy Valley's first full-time pastor. June 28, 1977, Rev. Mike Hudmon began his pastorate. To accommodate continued growth, a ground-breaking ceremony was held on November 25, 1977, for the addition of an educational building. A call was issued in September 1979 to Rev. Huey Brock, asking him to come as pastor followed by Rev. Bill Martin in April 1981. Through the years the church continued to grow in attendance and ministries leading to the need for additional worship space. Subsequently, a new sanctuary was completed, debt free, on December 20, 1986. The sanctuary was dedicated to the Lord's service on January 25, 1987. The expanding growth and ministries of Sandy Valley Baptist Church required additional Sunday School classrooms, restrooms, and a sound booth; which were all completed in April 1993. Over the years many additional building improvements have been made. Bro. Bill Martin's retirement in March 1998 led to Bro. Phil Bryant being called to serve as pastor beginning April 1, 1998. Bro. Phil continues to serve as pastor today. In 1999, Sandy Valley was blessed to be able to sponsor a Korean Ministry, which met in our facility until September of 2011. We were blessed on August 26, 2012 to have a Dedication Service for our new Youth Building. In December of that same year God blessed us with a digital sign. In September 2014, Dr. Don Jenrette was called to be our Associate Pastor. For the past 45 years this church has been blessed with a rich heritage. Throughout her history, many young men and women have been called to serve Christ here at Sandy Valley Baptist Church. God is still at work in her midst, and we anticipate great and mighty things to be done in the future days of HIS church.